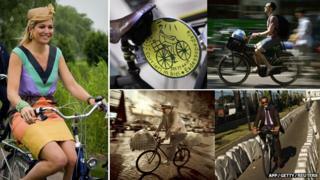 Figures from industry bodies indicate that bicycles outsold cars in 26 of the European Union's 28 states in 2012. It is thought the trend reflects a slump in car sales brought on by the continent's economic crisis. The popularity of cycling appears to be going beyond the traditional "cycling capitals" of northern Europe such as Amsterdam and Copenhagen. Italy was typical of many southern European states, with 1.6 million bikes bought as against 1.4 million cars. The northern Italian city of Milan is among the latest European cities to roll out a public bike-sharing scheme, modelled on widely-used predecessors in Paris and London. In 2011 car sales in Italy slumped to the level at which they stood in 1964, according to local media. The Spanish capital, Madrid, has recently unveiled plans for a "green ring" of cycle paths looping ten kilometres around the city. Only in Belgium and Luxembourg did car sales outstrip those of bikes in 2012. "There are more and more people cycling, as a fashion thing, but also for economic reasons," Pedro Carvalho, head of a magazine for cyclists in Portugal, told AFP. Authorities in London say the number of trips per day in the city by bike went up by 66% in the 10 years up to 2011 to reach 500,000. However, in November, six cyclists were killed on London's roads in the space of 14 days, raising questions over how safe it is to cycle on the capital's road. Is cycling in the UK getting more or less dangerous?